DeZURIK AWWA butterfly valves meet the requirements of AWWA C504 standards. They are used for shutoff of clean and dirty water and gases. Offset disc design, corrosion-resistant shaft, stainless steel disc edge, and self-compensating shaft seals are features on all DeZURIK AWWA butterfly valves. Molded-in body seat with disc locators provides positive sealing and longer seat life on sizes 3 – 20″ (80 – 500mm). Large AWWA butterfly valves, 24″ and larger (600mm and larger) feature adjustable, replaceable seat, non-hollow disc structure and rubber seat retained within a dovetail groove in the valve body and locked in place by an epoxy wedge. 25 – 75 psi (170 – 520 kPa) , 150 – 250 psi (1030 – 1700 kPa) CWP Shutoff – Bubble tight to full rated pressure. 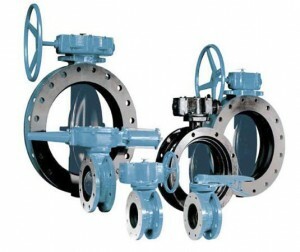 Square and rectangular AWWA butterfly valves are designed in a variety of sizes for square/rectangular configurations. Specially designed packages for Pump Check control applications are also available.